Friedrichshafen / Bremen, 26/02/2018 – Airbus, in cooperation with IBM, is developing CIMON (Crew Interactive MObile CompanioN), an AI-based assistant for astronauts for the DLR Space Administration. The technology demonstrator, which is the size of a medicine ball and weighs around 5 kg, will be tested on the ISS by Alexander Gerst during the European Space Agency’s Horizons mission between June and October 2018. “In short, CIMON will be the first AI-based mission and flight assistance system,” said Manfred Jaumann, Head of Microgravity Payloads from Airbus. “We are the first company in Europe to carry a free flyer, a kind of flying brain, to the ISS and to develop artificial intelligence for the crew on board the space station.” Pioneering work was also being done in the area of manufacturing, Jaumann continued, with the entire structure of CIMON, which is made up of plastic and metal, created using 3D printing. CIMON is designed to support astronauts in performing routine work, for example by displaying procedures or – thanks to its ‘neural’ AI network and its ability to learn – offering solutions to problems. It uses Watson AI technology from the IBM cloud and, with its face, voice and artificial intelligence, becomes a genuine ‘colleague’ on board. With CIMON, crew members can do more than just work through a schematic view of prescribed checklists and procedures; they can also engage with their assistant. In this way, CIMON makes work easier for the astronauts when carrying out every day routine tasks, helps to increase efficiency, facilitates mission success and improves security, as it can also serve as an early warning system for technical problems. Airbus initially examined the concept for the assistance system as part of a self-financed study. Then, in August 2016, the Bonn-based DLR Space Administration commissioned Airbus’ aerospace experts to carry out the project. Since then, a 50-strong project team comprising members from Airbus, DLR, IBM and the Ludwig-Maximilians-Universität Munich (LMU) has been working to ensure that CIMON takes shape and is brought to life: the system is learning to orientate itself and move around, it accumulates knowledge with the help of Watson AI technology and is training to recognise its human partners. Amongst other things, the Watson AI was trained using voice samples and photos of Alexander Gerst, and procedures and plans of the Columbus module of the International Space Station were loaded into the database. Alexander Gerst also had a say in the selection of CIMON’s screen face and computer voice so that he, too, could ‘make friends’ with his electronic colleague. 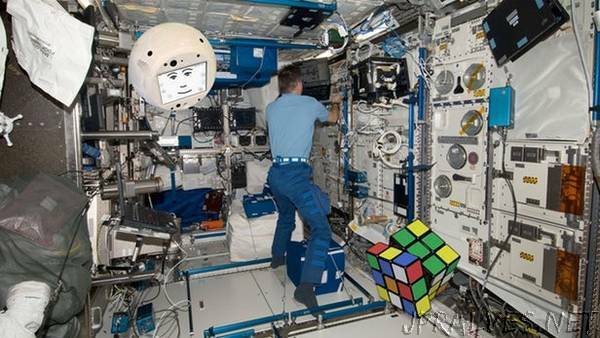 Once the functional testing of the system has been completed, Gerst will work in Space with CIMON a total of three times: They will experiment with crystals, work together to solve the Rubik’s cube and perform a complex medical experiment using CIMON as an ‘intelligent’ flying camera. In its first Space mission, CIMON will only be equipped with a selected range of capabilities. In the medium term, aerospace researchers also plan to use the CIMON project to examine group effects that can develop over a long period of time in small teams and that may arise during long-term missions to the Moon or Mars. Social interaction between people and machines, between astronauts and assistance systems equipped with emotional intelligence, could play an important role in the success of long-term missions. Airbus’ developers are convinced that, here on Earth, developments of the assistance system could also find future use in hospitals and social care.